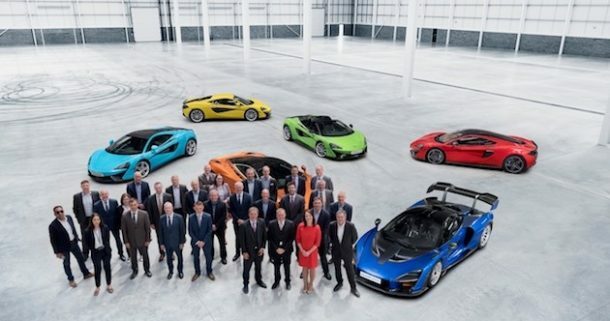 The MCTC in the Sheffield region will be the Yorkshire-based facility where McLaren will innovate the process for making the ultra-lightweight and strong carbon fibre tubs that are at the heart of all of its luxury family of sportscars and supercars. The finished tubs will then be sent to the McLaren Production Centre in Surrey where the company’s vehicles have been hand-assembled since 2011. Ruth Nic Aoidh, McLaren’s Executive Director, Commercial and Legal, received the ‘key’ to the building from Owen Michaelson, Chief Executive of Harworth Group plc who have built the unit for McLaren’s use at the Advanced Manufacturing Park in Rotherham. On display for the occasion were the company’s current family of products including members of the Sports Series and Super Series as well as a rare appearance by the McLaren Senna, all 500 units of which have been allocated to customers. When open, the MCTC will be home to only McLaren’s second ever production facility and the first outside its native Woking. Around 45 McLaren employees are already housed at the University of Sheffield’s Advanced Manufacturing Research Centre (AMRC), innovating the process for creating lightweight tubs and when fully operational, the team will grow to around 200 people. Also on hand to witness the handover alongside Harworth Group plc were a range of stakeholders closely associated with the build including senior representatives from Sheffield City Region, Sheffield City Council, Rotherham Borough Council, contractors JF Finnegan and architects The Harris Partnership. The building will now undergo several months of fitting out which will see all the manufacturing equipment installed, including a giant press that will make its way from Germany this summer. Ruth Nic Aoidh, McLaren Automotive’s Executive Director, Commercial and Legal for McLaren Automotive said: “Getting the key to the building that will house the McLaren Composites Technology Centre is a major milestone for us and the next chapter in our growth as a young, ambitious, innovative company. “It’s also an important day for all of the many individuals, organisations and suppliers who have supported and shared our ambitious plan to make the Sheffield region home to McLaren’s second production facility. This project is also testament to their shared mindset and the region’s long association with advanced materials that we are able to draw on and benefit from.